Help Plant a Tree House! • $5 – Your own small, sharp, round, and easily attached piece of Steampunk Tree House memorabilia, designed by our own Snarky McF*ckbutton. • $25 – The Tree House, in addition to being wired for digital sound (and plumbed for steam sound) has its own soundtrack. Did you know? Own the CD… created by our very own Nick Winterhalter. • $50 – The Tree House t-shirts, 100% cotton. Lovely, sturdy, simple. Hides grease stains exceptionally well (and we should know). • $150 – Branch pendant designed by 5TC crew member and professional jewelry designer Bonnie Heras, and made out of discarded metal from the Tree House’s reconstruction. • $175 – Laser-etched Tree House pin designed and built by artist Max Chen. • $200 – Limited edition print of the enigmatic portrait of an unknown adventurer created by artist and crew member Leslie Frierman Grunditz. The original still hangs on the Tree House’s walls. You can look on yours and speculate as to who else in the world is looking at the same mysterious gentleman at that very moment. • $250 – Limited edition Tree House T-shirt, and one of the aforementioned pins or pendants. • $2,500 -Your name cast in bronze on our donor wall inside the Tree House for future archaeologists to find and marvel over. • $5000 -Your name cast in bronze on our donor wall inside the Tree House for future archaeologists to find and marvel over. • $10,000 – A romantic catered dinner in the Tree House after it is permanently installed for you and a friend, with artist Sean Orlandoas your waiter. Your donations will insure this iconic sculpture finds it’s permanent place in the history of Public Art. •Major structural sections of the SPTH must be redesigned and rebuilt to insure it can withstand the hardships of east-coast weather! Our crew is already building a new roof, making the structure water-tight, and otherwise guaranteeing that this thing is still standing when the apes take over the world. • Our East Coast destination is a long way from our Oakland studio! • Several major artistic components need significant refurbishment! So… you live across the country, across the world, perhaps even in a different dimension, perhaps even near a far flung BART stop? No worries, you can still assist the Steampunk Tree House. Huzzah! Your employer might have a program in place that could double or triple your gift. Inquiring with the person who handles your company’s philanthropic efforts displays the sort of inquisitiveness and attention to detail that is essential in a space hero. The Steampunk Tree House is the offspring of countless individuals, businesses, and philanthropic institutions who have contributed essential goods to our missions: forged steel, gear driven vultures, and the finest in time machine prototypes, to name a few. If you have something that you would consider donating, please contact us and we will evaluate how to best use it. We guarantee that it will be used boldly and creatively to further the progress of science and human knowledge. We use Pay Pal, but you will not need a Pay Pal account to make a donation through our site. Credit cards will work marvelously. If you have any questions, please contact us. Our crew is always delighted to hear from individuals eager to assist the Steampunk Tree House in her exploits. The Steampunk Tree House is built of recycled wood, clockwork components and steel, styled after the worlds of early, handbuilt technology described by H.G. Wells, and Jules Verne. It was designed to spark the imagination, rather than to route it along a predetermined path. The Tree House has, at various times, been seen as a statement about nature, industrialization, childhood, environmentalism and the Victorian era. We’ve always preferred to let each person who passed through it make up their own story about what the tree is and how it came to be there. It was built by a crew of 60+ volunteers – engineers, artists, schoolteachers, and everything in between. 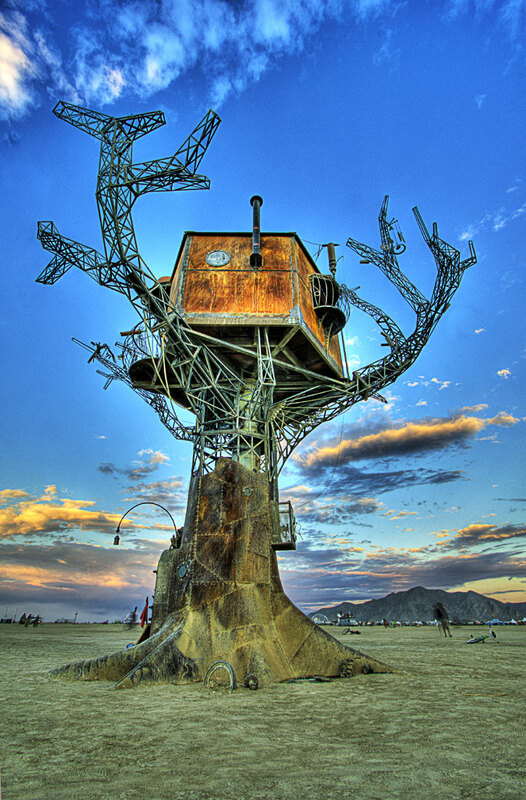 Help the Steampunk Tree House put roots down!